There are few actors working today who can captivate an audience like Jeff Briges can. No matter whether he's playing a quirky Army soldier (The Men Who Stare at Goats), an evil weapons manufacturer (Iron Man), a carefree bowling enthusiast (The Big Lebowski), or voicing a long thought dead surfer penguin (Surf's Up), he can come across in a big way, hitting a multitude of emotions and endearing himself to the viewers. He is a top notch talent and always hits a home run in his roles, even in movies that are fairly terrible (How to Lose Friends & Alienate People). This time, he tackles a film that is already worthy of consideration for an end of the year "best of" list and finds himself in a role guaranteed to include a few "Best Actor" nominations, including the already announced Golden Globes nod. Yes my friends, Crazy Heart is a special movie. Though I love all genres of film, I'm a person who finds himself stubbornly staving off any type of music other than good old rock n' roll. Put some country music on around me and my ears start to bleed, so imagine my skepticism when it came to this film about a washed up country music performer. What Crazy Heart proves, even to this jaded head banger, is that music can be beautiful regardless of what genre it's in. I was tapping my toes to the music and reveling in the discovery of how each song came to be, all of which came from the singer's own life experiences. Jeff Bridges plays the singer in question who for years has gone by the moniker of Bad Blake and as he tells a seductive journalist named Jean, played by Maggie Gyllenhaal, nobody will know his true name until the day he dies, where it will be written on his tombstone. She remarks, "That's a long time to wait," and he replies with what can essentially be paraphrased as, "Maybe not." His response comes with a few caveats. Despite the humorous nature of it, we later find out that Bad is in trouble. He is in danger of having a stroke due to an unhealthy lifestyle, which includes excessive smoking and drinking. He used to be the biggest star around, but now he is a nobody and his former band mate, Tommy, played by Colin Farrell, has gone off on his own and wrangled his own fans. Naturally, Bad is depressed and bitter, finding himself playing small shows in worn down bars and bowling alleys just to make a buck. After the aforementioned interview, Bad begins to fall in love with Jean and this is where the story really starts to take off. Bad has been miserable since his falling out an unspecified number of years ago and we assume it's all for legitimate reasons. Who wouldn't be miserable playing in small bars after your former band mate left you? Well, later we find out that Tommy didn't leave in hate and still respects Bad tremendously. He remarks to him how he'll never forget that it was him who gave him his start. Throughout the movie, Bad is heard spewing verbal hatred at Tommy and we simply take it as his way to deal with Tommy's crippling betrayal, but it simply isn't the case. He has no real reason to be mad at Tommy. He is merely confusing his jealousy for anger. After he reluctantly opens for him at a big gig, we finally discover this and realize there's something more brewing underneath Bad's seemingly hardened veneer. The reason he takes the gig in the first place is because of Jean, not because she urges him to, but because he starts to find happiness in her and starts to dismiss those feelings of hate. However, when everything finally seems to be turning around for the better and he finds himself getting his love for Jean returned to him, he ruins it with bad decision making. His alcoholism controls him and although he is asked by Jean to not drink in front of her young son, he stops inside of a bar one day while out with the little tyke and loses him due to his drunkenness. To continue on discussing this terrific story would be taking the pleasure of seeing it unfolding yourself away. However, it's the underlying message that really hits home and makes this movie something more than the sum of its parts. It shows a man emotionally and physically crippled from a number of problems, some external and some self inflicted, but finds hope in his cloud of depression. It says that it's never too late to turn your life around. No matter your age, your nasty habits or the turmoil you're going through, you can change yourself and become someone better, somebody who looks at life through a fresh perspective. Much more is revealed about Bad in this nearly two hour movie, but my adulation for Crazy Heart has already kept me rambling for far too long. Bad is a multi-layered person, simple on the surface, but hiding secrets within him and he summarizes his entire character arc with one lyrical line from one of his country songs where he sings, "I used to be somebody, but now I'm somebody else." Although there isn't much going on behind the camera, largely due to first-time director Scott Cooper, and the story is overly familiar—it's basically The Wrestler with more heart (as my friend Kevin "BDK" McCarthy put it)—it's done with such splendor and dedication that one can't help but be impressed with the finished product. 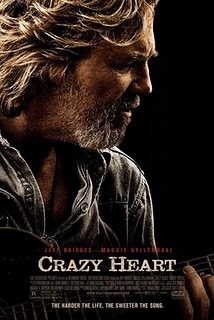 It's a shame Crazy Heart wasn't released in DC a couple of weeks back so I could rightfully place it on my 2009 best of the year list. Oh well. I guess 2010 will have to do.